Documentary captures a masterful improvisation duo and gives viewers an insight into what makes the performance art form tick. “Trust Us, This Is All Made Up,” a documentary about Chicago-based improv duo T.J. & Dave [T.J. Jagodowski and David Pasquesi], screened July 10 as a film offering at 92Y Tribeca, a venue with a rich comedy performance program, is an invaluable resource both for beginning and advanced improv students and performers, as well as educational for theatergoers who aren’t familiar with the art of improv performance. What makes “Trust Us” such a well-done documentary is its director Alex Karpovsky and cinematographer Ari Boles approach to documenting the nearly hour-long improv performance by T.J. & Dave in New York that makes up the bulk of the film. Merely filming an improv show flat, with one camera, would easily turn what might be exciting in a live theater into a dull proceeding onscreen. But the filmmakers used multiple cameras and in the film’s editing, often have two panels of action onscreen at the same time. These cinematic devices create visuals that echo the different characters and personalities TJ & Dave create on stage in their long-form improv, as well as the different scenes and settings that unfold. But the performance is not all there is to the documentary. 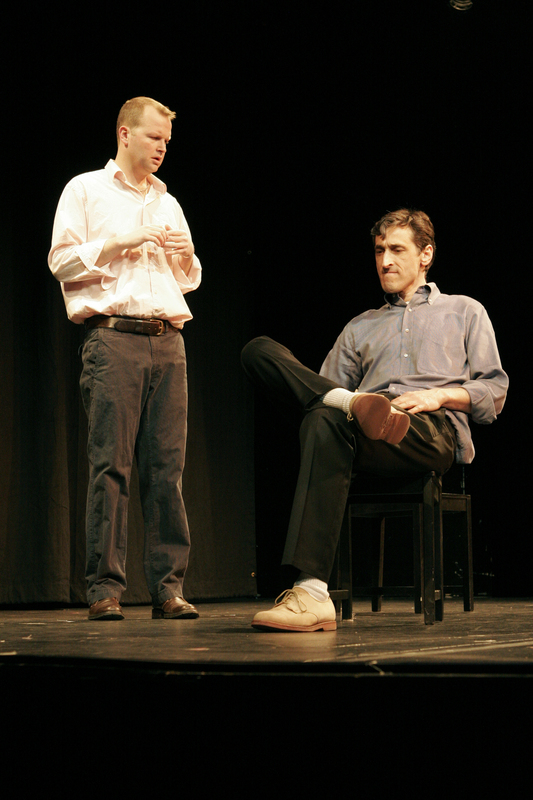 There is a prelude to get the viewer acquainted with T.J. & Dave and how they became a duo (Pasquesi once performed improv regularly in Chicago with Chris Farley and Tim Meadows, but moved more into dramatic acting for awhile after his colleagues went to SNL). However, this section serves also to explain clearly for the uninitiated what improv is all about, as T.J. & Dave describe how they communicate on stage in performance. “We know each other so well now that we know the littlest things each other does and can react to them,” Jagodowski says in this portion of the film, and that bears out as the viewer gets close-ups of their faces later in the performance where you can see those reactions in their eyes much more readily than you even might in the theater with them if you were too far away. In the performance chronicled in “Trust Us,” what starts as a seemingly humdrum office interaction, quickly spins into an intricate web of intrigue around the office softball team purposefully throwing games to ingratiate the company with the clients whose teams they’re playing, revealing characters like the boss driving the deceit, his receptionist, his assistant, an employee and player who’s disgusted by the revelation, and a few other office workers involved in the story, all played by the duo -- sometimes with the same character being played by the other performer to make a scene in the unfolding story possible. T.J. & Dave happened to be present to attend the screening, already here for one of their monthly runs in New York, continuing at 10 p.m. July 11 and 12 at the Barrow Street Theater. An eventual DVD release of “Trust Us” may end up adding another full-length performance by the duo that was filmed but not used in the documentary.